Move a wide range of material continuously, reliably and effectively in any direction without dusting. Not all drag conveyors are created equal. When your requirements for conveying systems include longer distances, unique layout configurations over multiple levels, numerous inlet and discharge points, the durability to handle abrasive material, or the ability to gently handle friable material, you need tubular drag conveyors from Hapman. As the material rests in-between the conveyor pucks, the material moves in an un-agitated state, providing you with the gentlest handling conveyor on the market. Since the material is conveyed in an un-agitated state, with no moving or turning of the material, you will find that there will virtually no separation of your product while it is being conveyed. This makes the Hapman Tubular Drag perfect for the applications handling pre-blended product. Your product gently rides between the pucks of the conveyor. This keeps the material from degrading on itself, or against too many external contact points, assuring you that your material will arrive at its destination in the condition needed for your process or end product. The Tubular Drag Conveyor can be provided with the nozzles, cleaning pack and solvents for a clean-in-place operation. Versatility Meets Durability in Hapman Tubular Drag Conveyors. Convey product in a completely sealed system. The sprocket drive in our tubular drag conveyors slowly pulls a heavy-duty chain through a fully enclosed pipe. As the chain moves your material through the pipe there is no chance for dusting, explosions or contamination issues. Use less energy than other conveyors. The low-horsepower motor produces the slow, steady drag that cuts your energy costs when conveying powders or bulk solids. Move challenging materials. Our tubular drag conveyors handle high-moisture ingredients and abrasive, blended, friable, easy-to-compact or smear products without compromising quality or efficiency. One conveyor does the work of several. A modular design means we can configure our tubular drag conveyors to move your product vertically, horizontally, at any angle and around corners. Need more than one inlet/outlet in your bulk material handling process? Add as many as you need. The fundamental operation of tubular drag conveyors involves a chain with flights that pull material through a sealed pipe circuit. They operate at high torque/low speed, and their capacity is determined by the diameter of the flight and the speed at which the chain assembly can be pulled through the pipe. Tubular Drag Conveyors are sealed to upstream and downstream equipment by a hard flange or a flexible sleeve. The layout of these conveyors allows for pipe bends, multiple inlet and discharge points, and routing through multiple planes and in any direction. All of our tubular drag conveyors are customized to fit the specific bulk material handling needs of your application and facility. Dust-free operation. Tubular Drag Conveyors feature completely sealed construction that confines bulk materials within the equipment. You convey materials in any direction – horizontally, vertically, at any angle and around corners – without dusting, odors, contamination, or spillage. Convey up to 50 cfm (1.416 cmm). A sprocket drive pulls a chain through a stationary outer casing. Flights attached at regular intervals along the chain convey material from inlet points to discharge points. Longer life from chain than steel cable. Chain is less prone to fatigue, wear and stretch than steel cable. 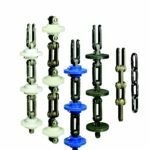 As individual parts on the chain wear out, you can replace them at a much lower cost and time expense than replacing the entire steel cable in other conveyors. Work day-in, day-out with minimal chain wear. A heavy-duty chain allows you to start, stop and operate our conveyors under load all day long. Discharge 100% of your product. Hapman’s exclusive, self-cleaning discharge gate is rounded to the shape of the pipe. Unlike flat gates in other conveyors, there is no place for your product to get trapped. Minimal maintenance required. 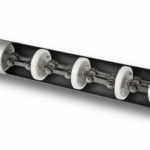 The automatic chain take-up idler in our Tubular Drag Conveyors makes adjustments as the chain stretches so you don’t have to do regular manual tightening. Eliminate multiple conveyors with multiple inlets/outlets. We can install numerous inlets and/or discharge points into a single tubular drag conveyor, allowing you to add ingredients and discharge product all along the way. Tubular construction lets you reconfigure your design as your floor layout or process needs change. Reduced energy usage. A low-horsepower, electric motor drives material for hundreds of feet. Hapman’s custom-built tubular drag conveying systems move some of the toughest products up to hundreds of feet: from hardened steel shot to bacon grease waste, from fishmeal and bones to explosive materials. Our expert consultants and engineers can spec out and build a system based on your specific bulk material handling needs. Paths are virtually limitless and multiple inlets and outlets are possible with our Tubular Drag Conveyors. Improve product flow when you install mechanical vibration. An offset weight and hammer system taps on the tops of flights to dislodge material. Fully discharge material with Hapman’s exclusive, self-cleaning discharge gates. Unlike flat gates in other conveyors, ours are rounded to the shape of the pipe so there is no place for your product to become trapped. Discharge Gate for Complete Material Release. See video below to view process. Brush Box for Easy Cleanability. See video below to view process. 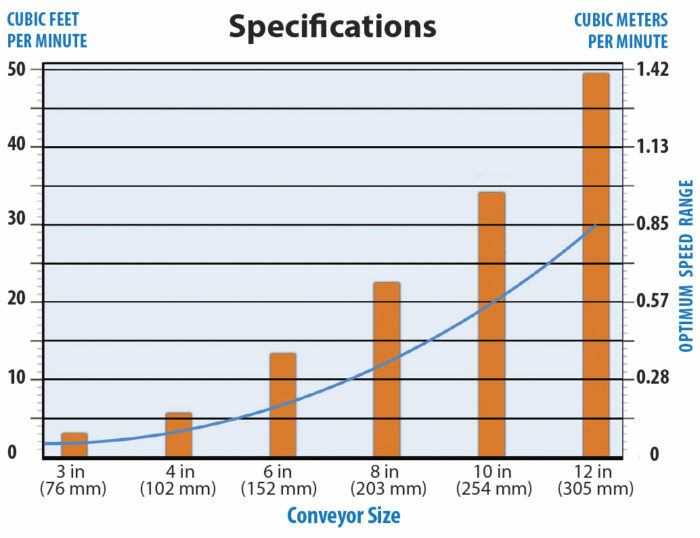 The chart below represents the optimum convey rate for most materials based on average capacity in cubic feet/minute and pipe size. Actual capacities vary depending on the material type, its abrasiveness and flow character. Chain vs. Cable – Which Conveying Type Works Best? During your evaluation of tubular drag conveyors to determine the best match your bulk material handling needs, you will need to assess the cable vs. chain comparison. While every application has different requirements and measurements for value, we present some of the most common differences between the two conveying types for your review. 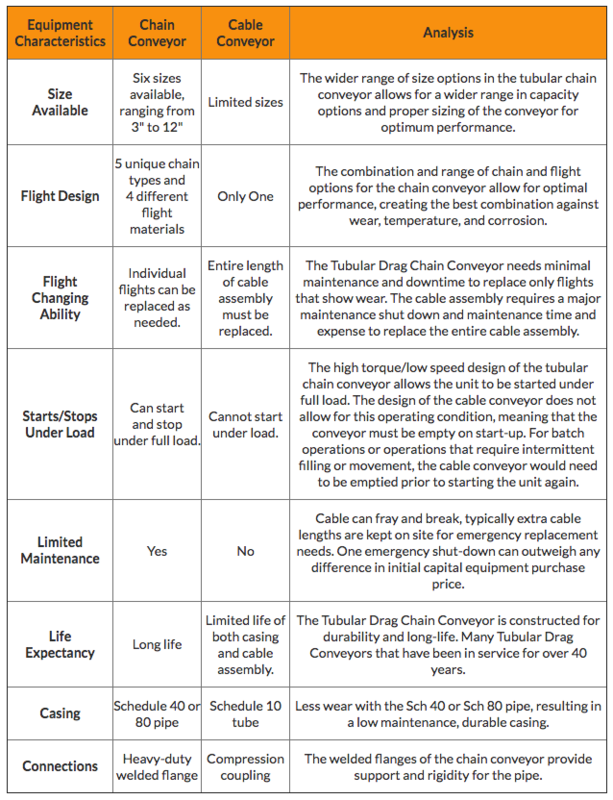 The importance of choosing the right conveyor chain and flight assembly. You never have to worry about selecting the correct chain and flight assembly for your bulk material handling application. We will work with you to determine the equipment that best suits your specific needs. We do not believe in a one-size-fits-all approach to conveying material. Flight material options range from UHMW polyethylene, glass reinforced polyethylene, cast steel, and iron. Each is engineered for exceptional conveying properties when evaluating bulk density, temperature, and other handling and material characteristics. The sealed pin keeps gritty, abrasive material out of the chain knuckle, reducing the need for frequent maintenance and significantly extending the life of the chain. UHUMW is cost-effective, lightweight, has excellent release properties, is low cost, and has a high wear resistance coupled with a low friction/drag. Each of these properties provides optimum conveying with low horsepower for reduced energy consumption. Do You Have Tubular Drag Conveyor Questions?